So, I’ve had a crap day at work… LOL. I know, not my usual optimism, but I really have had a crap day at work. It has to do with yesterday’s post in regard to being “someone else’s world”. The good news is tomorrow I see if I can get an extension on my visa, so it’s not an issue of going out of town. So, what am I doing this evening? I’ve had a lovely dinner, a cup of tea and I have all of the lights out and the candles burning all over my flat. I have love songs on… the last, one of my favorites; Joe Cocker singing just to me, “You Are So Beautiful”. And I’m loving it. And loving MYSELF and remembering that I deserve My love and attention 🙂 I’ll do this until 8:00 p.m., then I’m going to love myself even more by going out and running! This entry was posted in China, Life and tagged China, Exercise, Joe Cocker, love songs, postaday, running, self love, success, weight loss by flamidwyfe. Bookmark the permalink. Self love is a beauty treatment more powerful than anything in a bottle! Even on a ‘crap’ day you are moving in a positive direction. I love that! I’m feeling overwhelmed w/ the managing the blog thing…a little silly, yeah. I woke up tired b/c I stayed up too late. My am weigh in is up .5# and I’m wondering if it’s possible to be drinking TOO much water? Maybe I overate veggies. Ahhh, remembering the ham for dinner (?) It may have been too salty. Sandi, thanks for visiting my blog. This is an unusual adventure well outside my comfort zone….I’m a card carrying technophobe, but I attempt to stretch myself in a variety of ways, and this sure fits the bill. Part of the reason I did the blog (as it seems many do) is to prompt me to be 1) Accountable 2) Honest 3) Have fun doing both 1 & 2. Also, I am not sure how to set up the response portion so that the comments don’t have to wait so long for my ‘approval’. When I post here, I’m sure you are not always at your computer waiting to approve a post, yet it shows up very swiftly. Hmmm? Once you’ve approved someone one time, they are always approved in the future, so the comment I just left you, should have posted without your approval, and you won’t have to worry about it. Being accountable is why I started writing about my Dukan experience, and it definitely works! I’m so glad I did it. And it is fun, and I feel I’ve become a better writer for it. The ham could definitely be this morning’s culprit… you can actually drink too much water, but that when you get to the 3.5 liter or more level. I’m all loved up 🙂 And my run was fantastic… I was able to finish again tonight, with even less struggle… on to Day 2 tomorrow! Looks like border run will be delayed x 30 days… will know tomorrow morning… yipee! I clicked and wiggled around a bunch…you should be able to follow my blog now, thanks. I see now that the address posts in the comment in a different color and when someone clicks on it, it goes to my blog….that just happened, I didn’t ‘do’ that! I’m old enough to remember 2001 A Space Odyssey, and it’s kind of freaky how Hal-like computers are nowadays. I can see that I could spend too much time blogging, but it’s time to exercise. Have a great day. what a beautiful & oh-so-important message sandi! 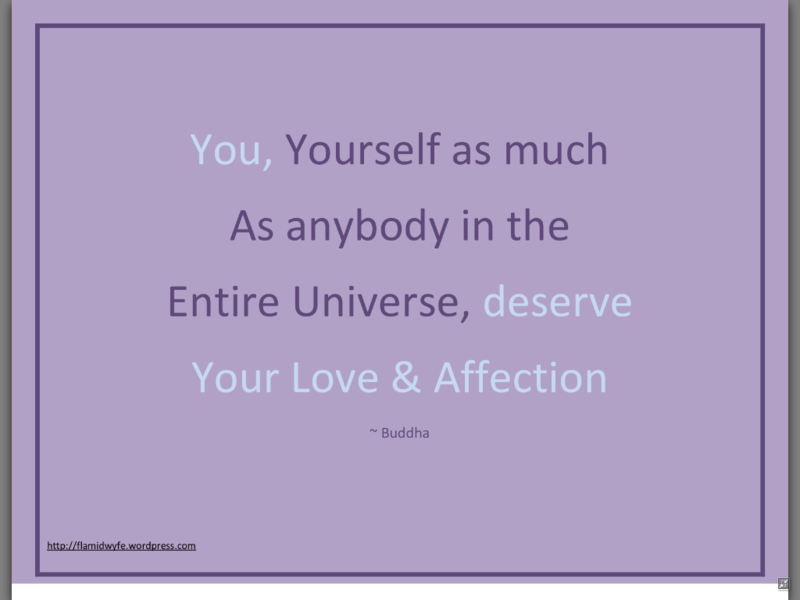 i am ALL about the self-love — with it we can do ANYTHING!!! ohhh & i got your message about the award (i am behind on reading & commenting) and i will be posting sometime this week about it — thanks SO much! Cyn, I think it is SO important to love ourselves. You’re welcome about the reward 🙂 Your blog puts a smile on my face, so the Sunshine award is apropos. Good to hear the running was fantastic. Running is a GREAT form of therapy. It may not be at the moment, but as it becomes more natural you will be at one with your thoughts as you run… I solve a lot of my problems while I am plodding along. Thanks, Mel… I am starting to enjoy it 🙂 Last night I completed the same circuit I did the night before… there is some pure satisfaction in doing so!